Whenever I go back to Reno, I’m amazed not by how different things are, but how they stay the same. The minute I step off the plane and see my first cowboy hat, I know it’s Reno. To me, it’s still a nice small town where Reno High School wins every game, and ranchers drive in to have a drink and blow their paycheck on Fridays. Of course it’s like every other town in America, and far more complex and diverse. Reno has another element that makes it different from other ranching towns in the west like Denver or Laramie. You can blame it on gaming, but it’s something else. I joke that Reno 911 gets it right at times, but The Misfits captures that feeling best. My mother tells stories about the filming of The Misfits in 1961. Marilyn Monroe, Clark Gable, and Monty Clift stayed at the Mapes Hotel downtown. People talked for 20 years about the event. 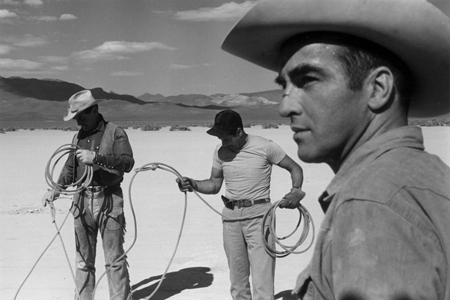 The still images shot during the filming capture that indefinable quality that talks about the wide open spaces of Nevada, not as a John Ford western, but as an enormous setting occupied by isolated individuals.